Rohe Creative is a Philadelphia-based interior design studio that specializes in creating curated, crafted and concept driven hospitality spaces. Our design team is youthful and inspired, with a diverse background of skills; from technical training in architecture and interiors to custom furniture design, product development and styling. Together we take a hands-on-approach, guiding each project from concept to completion. We are not tied to any single style or period. We prefer to take a step back before thoughtfully approaching a new project, then fully immersing ourselves in that world to ensure each project tells its own story. IN 2008, KATE BEGAN WORKING ALONGSIDE THE OWNER OF SLDESIGN, A SMALL BOUTIQUE FIRM IN PHILADELPHIA. COLLECTIVELY, THE CREATIVE DUO DESIGNED AWARD WINNING RESTAURANTS, CAFES, HOTELS, BARS AND LOUNGES OF ALL STYLES, SIZES AND BUDGETS. SHE HAD THE OPPORTUNITY TO TAILOR EACH PROJECT TO THE CLIENTS UNIQUE NEEDS AND WAS INVOLVED IN EVERY PART ALONG THE WAY. THEY WERE THE PROUD RECIPIENTS OF HOSPITALITY DESIGN AWARDS, AND HAVE BEEN PUBLICIZED IN TRAVEL AND LEISURE, ELLE DECOR, INTERIOR DESIGN, HOSPITALITY DESIGN, DESIGN BUREAU AND PHILADELPHIA MAGAZINE, TO NAME A FEW. YOU CAN READ NUMEROUS WRITE UPS ONLINE AT EATER, GRUB STREET AND APARTMENT THERAPY. HER TIME AT THESE FIRMS GAVE HER THE DISTINCT PLEASURE OF WORKING ALONGSIDE THE BEST OF THE BUSINESS; BR GUEST RESTAURANTS, STARWOOD CAPITAL GROUP, TOWER INVESTMENTS, ONE SHOT COFFEE, MICHAEL MINA RESTAURANTS, MGM GRAND, MICHAEL SCHULSON, ROB WASSERMAN, STARR RESTAURANTS AND LDV HOSPITALITY. 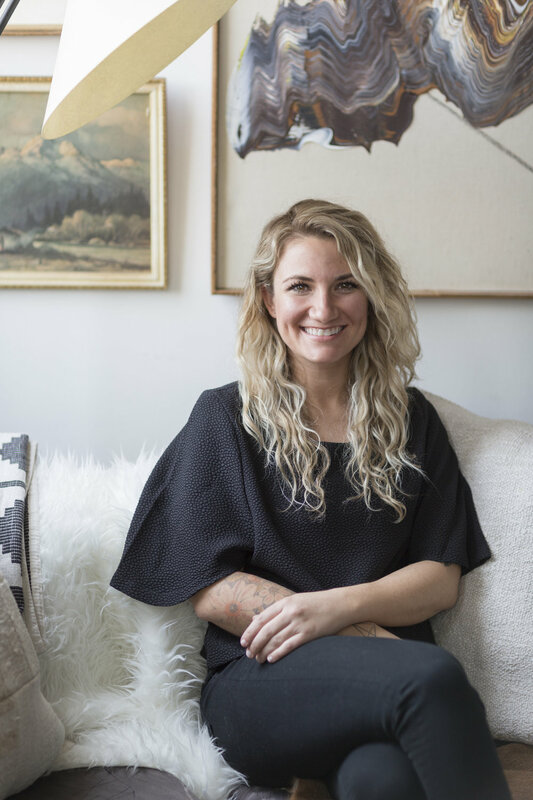 KATE STARTED ROHE CREATIVE TO BUILD UPON HER HOSPITALITY PAST AND CREATE A COLLECTIVE OF CREATIVE SERVICES ALL HER OWN. SHE IS PASSIONATE ABOUT ALL ASPECTS OF DESIGN AND HER SMALL WOMEN OWNED AND OPERATED BUSINESS. KATE HAS A UNIQUE UNDERSTANDING OF DESIGN PAST AND PRESENT. SHE IS ABLE TO SEAMLESSLY CONCEPTUALIZE AND CREATE, WHILE BEING SENSITIVE TO BUDGETS AND TIME CONSTRAINTS. IN HER FREE TIME, KATE CAN BE FOUND ENJOYING TIME WITH HER FIVE YEAR OLD SON, OLIVER, AND HER PARTNER RYAN. MOST LIKELY DRAGGING THEM TO A FLEA MARKET, OR CONTINUALLY RENOVATING THEIR FAMILY HOME IN KENSINGTON, PHILADELPHIA.